Port Of Hueneme Hosts Homeland Security Drill - U.S. Coast Guard, Center for Asymmetric Warfare and other agencies partner to protect Coastal Environment. The half day OPSTAR exercise called for a simulated attack and occupation of an Off Shore Oil Platform within the Santa Barbara Channel and included a no-notice level III activation of the Santa Barbara County Office of Emergency Management as a ‘stress test’ of its infrastructure and technology capacity. 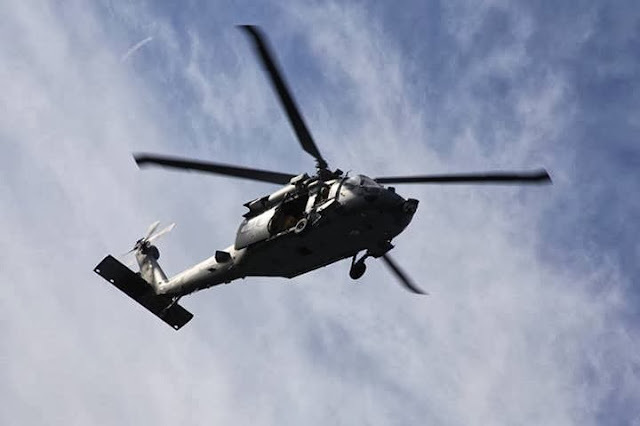 The exercise was designed to test regional security and communications protocols and the ability to thwart terrorist attacks on local assets and interests. The exercise took place in Ventura County utilizing security assets at the Port of Hueneme. 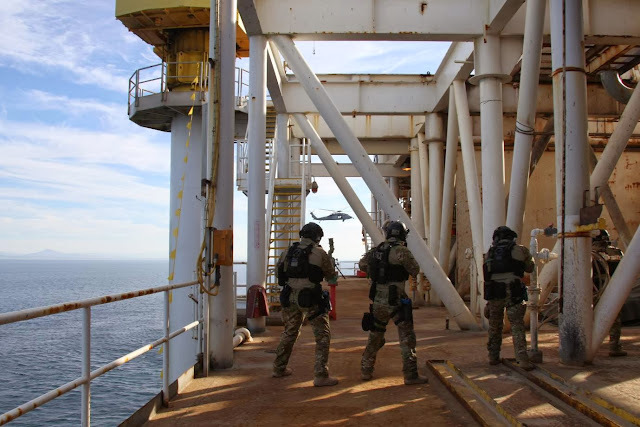 The Port of Hueneme participated yesterday in the first security drill since the rollout of the Port’s new Maritime Advanced Systems and Technology Lab (MAST) program hosted an Offshore Platform Security Threat Awareness and Response Program exercise (OPSTAR) conducted by the Naval Postgraduate School’s Center for Asymmetric Warfare and the U.S. Coast Guard. The research and experimental use of sophisticated radar, video, satellite and telecommunications technologies assisted in the multijurisdictional planning and coordinated communications efforts of the various participating agencies as well as provided maritime domain awareness supporting tactical events taking place on the Offshore Platform, from various points of view including the deployment of maritime special operations forces. The exercise was deemed a success with the Coast Guard’s LA/LB sector Captain of the Port Captain Jim Jenkins saying, ”This exercise provided a great opportunity for the Coast Guard to work with our security partners at the Port of Hueneme. 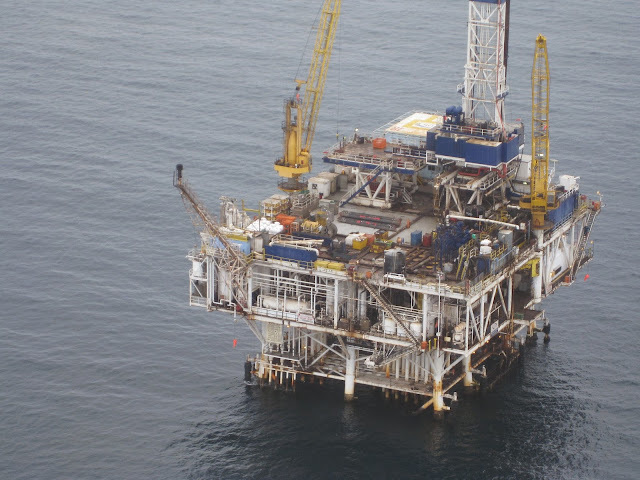 Our Maritime Safety and Security Teams exercised their capabilities in the scenario while acquiring control of an Offshore Oil Platform, accessing it from the air and the sea." The Center for Asymmetric Warfare brought an impressive array of technology to support the security and command and control teams during the event. The Center for Asymmetric Warfare (CAW) was established in 1999. CAW is a U.S. Navy entity dedicated to supporting U.S. military forces, as well as local, state, and federal organizations, in countering and controlling the effects of asymmetric warfare, and in support of the Global War on Terrorism. Their focus is on training & education, technology evaluation and the execution of complex, multi-agency exercises, expanding on our maritime/port security heritage. In 2008, the CAW joined the Naval Postgraduate School as a satellite division, located at NAS Point Mugu, CA and is aligned under the Research Department. As part of the Research Department, the CAW has the flexibility to operate across the 4 institutes and 4 schools that make up NPS. It also allows the CAW to capitalize on the expertise of their many distinguished alumni, faculty and students that can perform as interns. A fire ripped through a commercial building on South Figueroa Street in South Los Angeles on Friday, Nov. 29, 2013. SOUTH LOS ANGELES (KABC) -- A fire ripped through a commercial building in South Los Angeles early Friday morning. Nearly 100 firefighters battled the flames, which erupted just before 1 a.m. on the 5900 block of South Figueroa Street. It took fire crews about half an hour to get the fire in the 89-year-old building under control. According to firefighters, neighbors said transients had been using the vacant building for shelter. No one was hurt, but damage is estimated at $200,000. Officials believe the fire was accidental, but the investigation continues. Fire fighting personnel from the Sequoia National Forest Kern River Ranger District are currently conducting a prescribed burn operation on National Forest lands adjacent to homes in Alta Sierra within the Greenhorn Mountains. 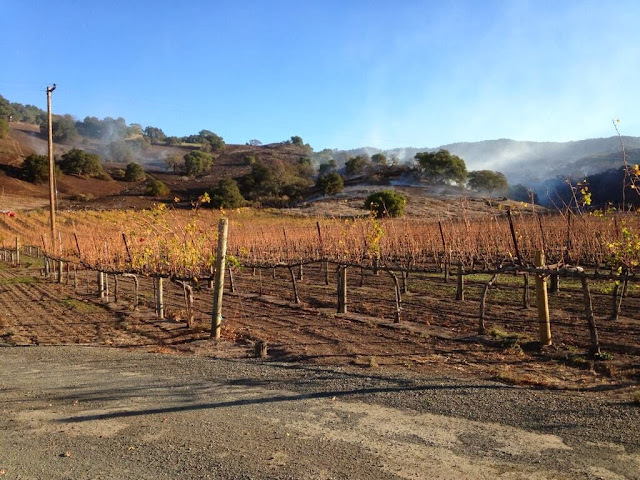 In the past two weeks 140 acres have been burned adjacent to private property both east and west of Highway 155. Prescribed burning is being conducted in small individual units designed to minimize effects of smoke on the community while reducing the potential for large stand replacing wildfires. The project also serves to regenerate the forest and provide a diverse and important animal habitat for many species including deer bear and quail while maintain diversity for sensitive species such as goshawks fisher and spotted owls. The pres. burn is making good progression. Occasional smokes will continue to smoulder in heavier fuels. Burn is in patrol status and being monitored. Volunteer fire company 47 gets dispatched on a smoke investigation, only to find out it was a bag a spicy Doritos. Proceeds awarded to this TV spot will go directly to the "Union Deposit Volunteer Fire Co."
The Union Deposit Volunteer Fire Company is hoping to see itself on TV during the Super Bowl, not because its members plan on attending, but because they’re hoping to be the stars of one of this year’s Doritos commercials. The firefighters from South Hanover Township created a 30-second spot in hopes of raising awareness of their fire station and raising some much-needed funds. “Doritos puts on this competition each year and this was a way for us to try to generate some revenue,” Kevin Gern, fire chief at Union Deposit Volunteer Fire Company, said. The winner of the contest is rewarded $1 million and given a trip to the Super Bowl, but Tom Brumbagh, deputy fire chief at Union Deposit Volunteer Fire Company, says it’s about much more than that. “Publicity for the fire company, get our name out there,” he said. The all-volunteer fire department depends on residents of South Hanover Township to give their time to help keep their community safe. Two members of San Francisco Fire Department's top brass and three lower-ranking firefighters face possible suspensions stemming from an incident in which a firefighter suspected of being drunk struck a motorcyclist with a ladder truck and left the scene, The Chronicle has learned. Chief Joanne Hayes-White has notified Assistant Chiefs Art Kenney and Dave Franklin that they could be suspended for 10 days and eight days, respectively, for their actions the night of the crash, June 29, sources familiar with the investigation said Monday. The commanders were in charge of the crash scene shortly after firefighter Michael Quinn, 43, struck and seriously injured motorcyclist Jack Frazier at Fifth and Howard streets. Quinn was responding to what turned out to be a false alarm when he entered the intersection on a red light and struck Frazier, who suffered broken ribs and a punctured lung when he was thrown into a fire hydrant. Quinn allegedly left and did not return to the department's Station No. 1 down Howard Street for several hours. Sources have said that a surveillance camera filmed Quinn guzzling water at a bar at Fifth and Howard streets after the crash. Another high-ranking official who was at the crash scene, acting Battalion Chief Mark Hayes, faces a possible four-day suspension, according to the sources, who spoke on condition of anonymity because personnel cases are not public record. The basis for the possible suspensions of the two assistant chiefs and Hayes was not immediately clear. Under city rules, the chief can impose suspensions of up to 10 days without approval from the city Fire Commission. Any firefighter's appeal of a suspension would go before the commission. Two lower-level firefighters face more serious discipline that requires the commission's review, sources said. One is Warren Der, who was the tillerman operating the truck with Quinn and was reportedly seen on the bar surveillance video with Quinn. He faces a 30-day suspension, as does the commander of the truck that Quinn was driving, Capt. Matt Schwartz, sources said. Fifteen other firefighters who were on duty that night were sent letters declaring that they were cleared, sources said. Quinn, who faced possible firing based on a battery of misconduct charges, recently resigned. A police investigation is continuing, but Quinn has not been hit with criminal charges. Quinn had been ordered to wait at the crash scene to submit to drug and alcohol tests. Instead, he left and went to the Chieftain bar, just a few feet from where the crash happened, and drank large amounts of water, sources said. When Quinn returned to his stationhouse, his blood alcohol content was tested at 0.13 percent, well above the 0.08 percent legal limit, sources said. The Fire Department has a zero-tolerance policy for on-duty drinking. Hayes-White said she could not confirm details of the possible disciplinary actions. But she acknowledged that about 20 firefighters had received letters from the department, some alerting the recipients of possible discipline and some declaring that the recipients had been cleared. She said her review showed that "different decisions could have been made that night." "I believe in my heart of hearts," she said, that there was no collusion between firefighters in the Quinn case. "What has been alleged is that it was a cover-up," the chief said. "I don't believe that there was a cover-up that evening, nor did the administrative investigation that we conducted indicate that. "Could there have been other, perhaps better decisions that night? Yes." SOUTH LOS ANGELES - Four Los Angeles Firefighters were injured while fighting an early morning commercial blaze in a textile building. At 3:18 am, November 21, 2013, the Los Angeles Fire Department was summoned to a report of smoke at the intersection of 31st street and Central Avenue. Firefighters arrived quickly to find flames billowing from the rear of 943 East 31st Street, a one story 8,000 square-foot, industrial building. Upon arrival, an aggressive interior fire attack ensued. Simultaneously, firefighters climbed ladders to perform vertical ventilation, cutting holes in the roof to remove gas, heat, and smoke. During roof operations, a firefighter was engulfed by the building and flames when a partial structural collapse occurred. The firefighter fell to the ground inside the building where his colleagues affected a rescue. Evacuation of all personnel was ordered and the firefight continued from the exterior. Just over 100 firefighters, all under the command of Battalion Chief Greg Gibson , extinguished the flames in one hour. Although surrounding buildings were brushed by flames, the intense blaze was contained to the building of origin. During the roof collapse and subsequent rescue, four firefighters sustained non-life threatening burn injuries. All were transported to area hospitals in what was initially reported as serious condition. The four firefighters were evaluated, treated, and later released from the hospital. Monetary loss is estimated at $500,000 ($200,00 structure and $300,000 contents). The cause of the early morning blaze is under active investigation by the LAFD Arson/Counter-Terrorism Section. A family member working with a search-and-rescue team found Ann Lory about 11:30 a.m. in the search area near Foresta, a small community near Yosemite's western boundary, park officials said. Lory was taken to a hospital. The extent of her injuries was not disclosed. Yosemite National Park Rangers are searching for Ann Lory, 60, a resident of Foresta, who has been missing since Saturday morning, November 23, 2013. 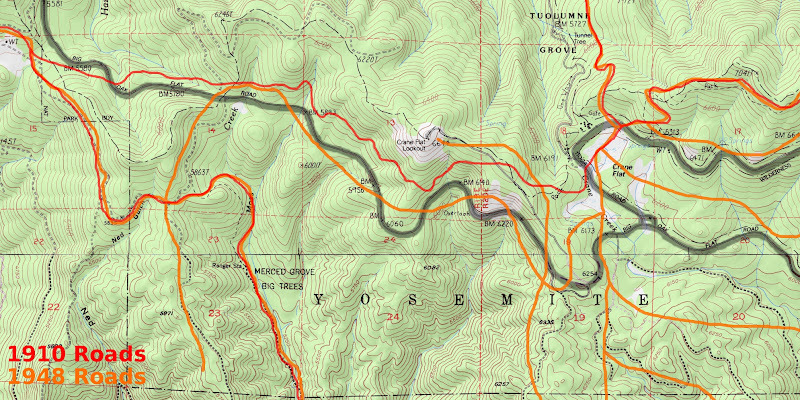 Foresta is a small community located along the western portion of the park boundary and can only be accessed through the park via Highway 120 (Big Oak Flat Road). Lory reportedly left her residence early Saturday morning, November 23, to hike along the Old Coulterville Road and the Old Big Oak Flat Road in Yosemite National Park. Lory is 5’ 6” tall, 110 pounds, and has grey hair and hazel eyes. The type of clothing and gear she had with her is unknown. Yosemite Park Rangers are currently conducting the search in and around the Foresta area. Approximately 70 people are involved in the search effort and the park is utilizing dog teams to assist in locating Lory. If any park visitors or employees were in the area of the Old Coulterville Road and the Old Big Oak Flat Road on Satruday, November 23, please call (209) 379-1992. The park is receiving assistance from the Madera, Fresno, Tuolumne, Kern, Merced, and Mariposa Counties Sheriff’s Office Search and Rescue. Additionally, the Fresno Office of the California Highway Patrol and the California Office of Emergency Services are assisting in the search efforts. Update 11/29 1800: 305 acres, 100% contained. Update 11/27 1800: 305 acres, 70% contained. Update 11/26 1800: 305 acres, 70% contained. Update 11/25 0800: 305 acres, 70% contained. Update 11/24 0800: 400 acres, 10% contained. Expected containment 11/29/13. Fire behavior minimal overnight. Heavy fuels burning out. No new fire spread. Update 11/24 0800: 400 acres, 10 % contained. No fire increased spread over night. 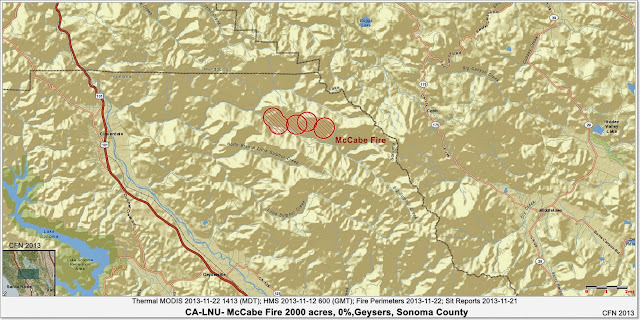 Moderate fire behavior observed as heavy fuels burn out. Expected containment 11/29. Update 11/24 0800: 350 Acres, 5% contained. Minimal fire spread overnight. 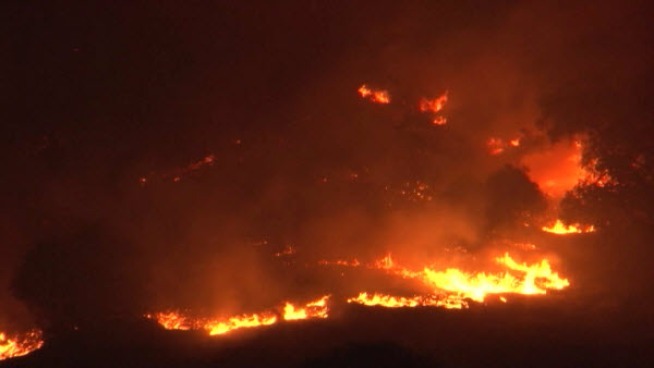 Fire expected to continue to spread during the day toward ridgeline road system. Numerous snags, heavy fuels: dense brush and knobcone stands with many large logs from 1996 Forks fire, steep terrain with poor access. Update 11/23 1800: 350 acres, 0% contained. Fire made short runs due to high winds. Aircraft was grounded for a period of time due to high winds. 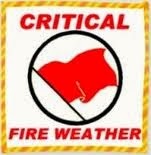 As winds died down Saturday afternoon, the rate of spread has slowed, Access to fire is limited due to downed trees. Update 11/23 0930: 200 acres, 0% contained. Fire is burning in with very limited access. IC: Type 3 Organization is in place. Location: Fire is located in a very remote area north of High Glade Lookout on the Upper Lake Ranger District of the Mendocino National Forest. Smoke from the fire was highly visible Saturday afternoon in the mountains west of Interstate 5, Cause: Under investigation, according to forest officials. CHP states that the crash occurred when seven members of the “hot shots” crew were in a 2002 Hyundai Accent sedan traveling westbound on Marysville Road. “This is a tragic loss for Mike’s family, for Tahoe National Forest and for the firefighting community,” said Tahoe Forest Supervisor Tom Quinn in a statement. CAMPTONVILLE, Calif. — A Forest Service firefighter with Treasure Valley roots was killed Saturday when he was struck by a car driven by a fellow crew member. California Highway Patrol said Michael Patrick Kelly II, 32, was lying on the road when he was hit early Saturday three miles from Camptonville, Calif.
Kelly worked as squad boss and full-time forest firefighter with the Tahoe Hotshots Crew, stationed out of Camptonville. Raised in Meridian, he graduated from Eagle High School in 1999. A driver told police that he spotted Kelly lying on the road, and flashed his highbeams to warn an approaching car of the pedestrian. But the oncoming car — driven by 26-year-old Andrew Gruenberg — a Hotshot on Kelly’s crew, did not stop. The small car containing Gruenberg and his six passengers, all members of the Tahoe Hotshots Crew, ran over Kelly, who died at the scene from head and torso injuries. Gruenberg thought he had hit an animal, investigators said, and continued on two miles to his destination. A passenger in his car called 911 to report a hazard in the roadway. After reaching their destination, two of the Hotshots got into another car and returned to the scene of the collision to see what the car had hit. The Hotshots were greeted by the sight of emergency crews, who confirmed that Kelly died from being run over. California Highway Patrol investigators say that alcohol was a factor in the crash, but no arrests have yet been made. The collision remains under investigation, and toxicology results are pending. DURING THE DAY ON SATURDAY...BUT VERY DRY CONDITIONS WILL PERSIST. SATURDAY NIGHT ARE EXPECTED TO BE MUCH BETTER. 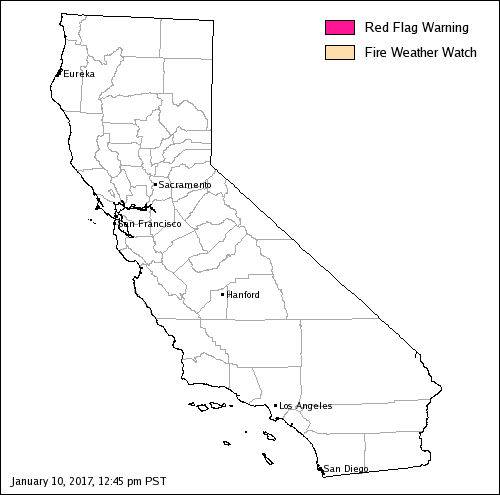 RED FLAG WARNING...WHICH IS IN EFFECT UNTIL 5 PM PST SATURDAY. 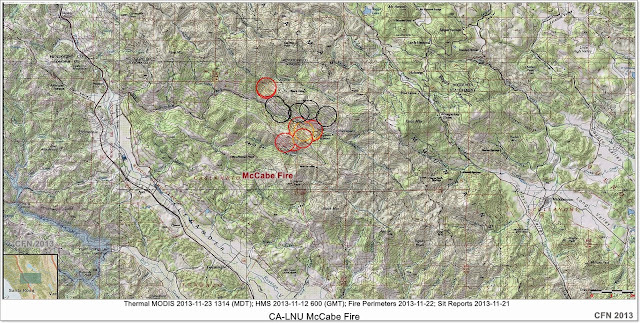 * AFFECTED AREA: FIRE ZONE 506 NORTH BAY INTERIOR VALLEYS..
FIRE ZONE 507 NORTH BAY MOUNTAINS. EXPECTED ON FRIDAY NIGHT...GRADUALLY DIMINISHING ON SATURDAY. SUBSIDE TO ABOUT 5 TO 15 MPH. BETTER HUMIDITY RECOVERIES EXPECTED SATURDAY NIGHT. A large hay truck went off the where current Rim Fire BAER Team work is taking place. The CHP is reporting that it went about 100-150 ft. over the bridge. Update 1700: CHP is confirming one person has died in a crash at the Clavey River Bridge in the Stanislaus National Forest. The Tuolumne County Coroner has been called to the scene. CHP reports crewswilltow the truck from where it landed after plunging 100 to 150 feet over the bridge in morning. Update 12:30: CHP reports officers are directing one-way traffic over the Clavey River Bridge. The Sheriff SAR on sscene. Location: Clavey River Bridge near Cottonwood Road Stanislaus National Forest, Tuolumne County . Resources: Air ambulance and Sheriff's Office SAR rope team, hazmat crew is responding to reports of diesel fuel running into the river. Update 11/27 2000: 3505 acres, 100% contained. Update 11/27 1730: 3505 acres, 95% contained. Update 11/26 0730: 3505 acres, 90% cont. Update 11/25 0730: 3,505 acres, 75% contained. Expected containment 11/27/13. Acreage adjusted due to more accurate mapping. 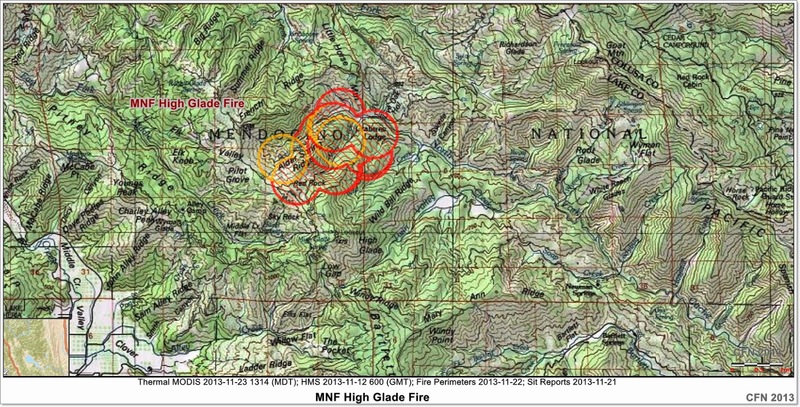 Isolated fire activity within the containment lines. Update 11/24 1730: 3,300 acres, 65% The incident had isolated fire activity within the containment lines. Significant demobilization of resources is planned for 11/25-26. Update 11/24 0730: 3,300 acres, 35% contained. Spotting issues due to severely dry fuels and record high ERC. A slow rate of production in control line is due to high winds and difficult terrain. Update 11/23 1730: 3000 acres, 25% contained. CAL FIRE Team 3 Michael. Moderate fire spread expected as winds transition to on shore. A threat remains to geothermal electrical generation facility and multiple permanent residences. Update 11/23 0730: 2500 acres, 0% contained. 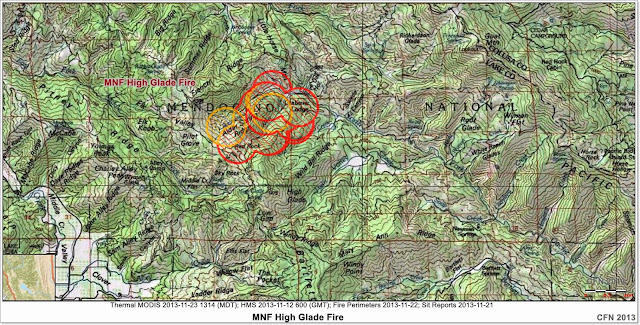 Fire has three heads with erratic fire behavior and long range spotting. Evacuations in progress. One geothermal Power Generating Facility destroyed. Update 11/22 1730: - 2500 acres, 10% contained. Expected containment 12/01/2013. Michael, CAL FIRE IMT 3 has been activated for this fire and will transition with Turbeville, ICT3. Continued threat to the Geyser Geothermal Facility. Update 11/22 1600: - 2,000 acres, 0% contained. Expected containment 12/01/2013. Turbeville, ICT3. 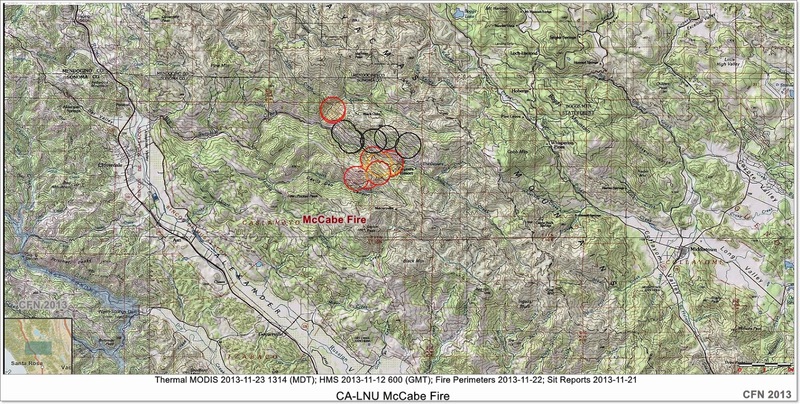 Long range spotting and erratic fire behavior. Threat to Geyser Geothermal Facility. Tomorrow Order for 20 Golfs, 10 Charlies, 7 Limas, 3 Branchs, 9 Divs, and overhead. Update 11/22 0800: - 100 acres, 10% contained. ROS: Moderate to rapid rate of spread. ROC: - Located in steep terrain near power plants five and six. Damage from the windstorm also made access difficult, with a fallen tree blocking one of the access roads from the Lake County side and power lines reported to be down. Special Hazards: Power lines down, geo-thermal activity in the area. Structure Threats: - Threat to Geyser Geothermal Facility. Additional Resource Notes: - Numerous resources from Lake and Sonoma counties. Mandatory Evacuations: About 50 families were evacuated. Emergency shelter had been opened at Napa High School. Update 11/23 0700: - 300 acres, 70% contained. Expecting containment this evening. Update 11/22 1700: - 300 acres, 70% contained. Update 11/22 0700: - 250 acres, 50% cont. Update 11/22 0700: - 350 acres, 25% contained. Located near Silverado Trail in Napa. Fire is burning in grass, oak and woodland with a moderate rate of spread. Evacuations are in progress. Situation Concerns/Alerts: - Strong wind gusts were reported throughout the region, reaching as high as 55 mph in some areas. 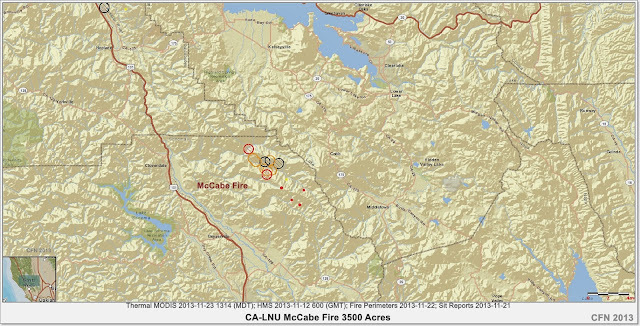 Labels: 2013 Wildfires, Lake Napa Unit, Napa, Silverado Trail.